I want to have a career in scuba diving. How do I become a Scuba Diving Professional? You can start your scuba diving career in Utila at our Instructor Development Centre by taking the first PADI Professional Scuba Diving course: PADI Divemaster. Once you have completed Divemaster Internship training you can enhance your career and become a Scuba Diving Instructor and teach people how to dive by taking the PADI Instructor Development Course at Underwater Vision with PADI Silver-rated Course Director, Diego Frank. You do not need to have any Divemaster work experience to do the IDC. Please visit our PADI Go Pro page for more information on how to become a scuba diving professional in Utila. Which courses must I take to be prepared for and eligible to enroll in the PADI Divemaster Internship course at Underwater Vision? In order to begin your PADI Divemaster course you must be a certified PADI Advanced Open Water Diver, a PADI Rescue Diver and be Emergency First Response certified. You can do all of your training in Utila at Underwater Vision and we offer great package deals for bundles of courses and a fantastic ‘Zero to Hero’ package for those who fall in love with diving during the PADI Open Water Diver and want to go straight through to PADI Divemaster! Check out our pages on How To Go Pro for more information. Please contact us for prices, discounts and specials! Can I go directly from completing my PADI Divemaster Certification to the PADI IDC and become a PADI Open Water Scuba Instructor? Yes you can! 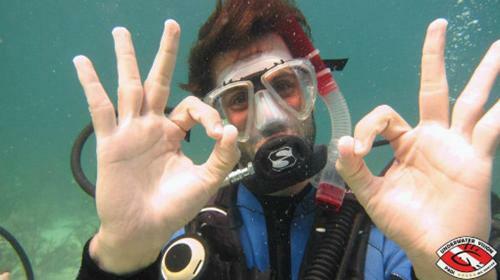 At the time of your enrollment in the IDC at Underwater Vision you must have been a certified diver (completed your PADI Open Water Diver or equivalent certification from a recognized diver training organization), for at least six months. You need to have at least 60 logged dives before enrolling in the IDC and 100 before you can take the Instructor Exam (IE). We can help you to get the required number of logged dives before the IDC. Contact us to make arrangements.